Salt is a dietary mineral composed which is primarily made up of sodium chloride and is essential for animal life because it helps to regulate the water content in the body. 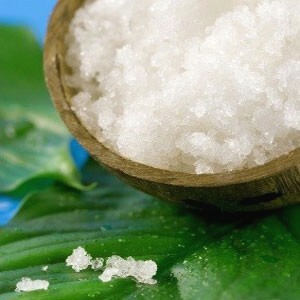 Salt is also one of the basic taste flavours and many chefs use it to create their tasty restaurant dishes. Salt is an extremely common and cheap condiment that is found in every family's kitchen. Most people use salt only in their cooking or sprinkled over their food, however there are also a lot of other uses for salt. These uses range from removing stubborn stains and cleaning right through to personal grooming and as skin care products. There are a number of different varieties of salt available including dead sea salts, rock salt, epson salts, magnesium salts, chlorine salt for pools and of course common table salt. Each of these salt types has its own particular characteristics and hence there are many different uses for salt. This variety, combined with its ready availability, low cost and capacity to save you money, makes salt one of the most useful and practical products around the family home. We hope that you appreciate and are able to use some of the Free salt uses that are available on this website. If you would like to share your own tips or experiences on salt uses then you can do so by clicking here.